Lectins are proteins found in all life forms, including the food you eat. Interestingly, they have both positive and negative effects. Studies show us that they can hinder the absorption of some nutrients – and this can be dangerous. Does this mean you need to avoid those foods that contain lectins? Let’s see what research says. Which Foods Are High In Lectins? How Else To Reduce Lectins From Your Favorite Foods? Lectins are specific carbohydrate-binding proteins that help facilitate communication between the body’s cells (1). They are ubiquitous – found in plants, animals, and even microorganisms. They also contain nitrogen that is essential for plant growth. The characteristics of lectins that help defend plants may cause issues in human digestion. Lectins resist being broken down in the gut, potentially contributing to disease. These proteins, when taken in their active state, can cause negative effects (2). The most publicized of these effects are those due to the intake of raw or undercooked kidney beans. These contain phytohaemagglutinin, a lectin that causes red blood cells to clump together. The effects include nausea, an upset stomach, diarrhea, vomiting, and bloating (3). Other animal studies have also found that active lectins can interfere with nutrient absorption. This happens when lectins bind to the cell lines of the digestive tract, disturbing the breakdown and absorption of nutrients (especially calcium, iron, zinc, and phosphorus) (2). Lectins bind to cells for long periods, possibly triggering autoimmune responses. Some sources suggest that this may lead to inflammatory conditions like rheumatoid arthritis and type 1 diabetes (4). Does this mean that you need to refrain from having foods high in lectins? We don’t exactly recommend that – for reasons we will discuss later in this post. But first, we shall look at the foods high in these proteins. 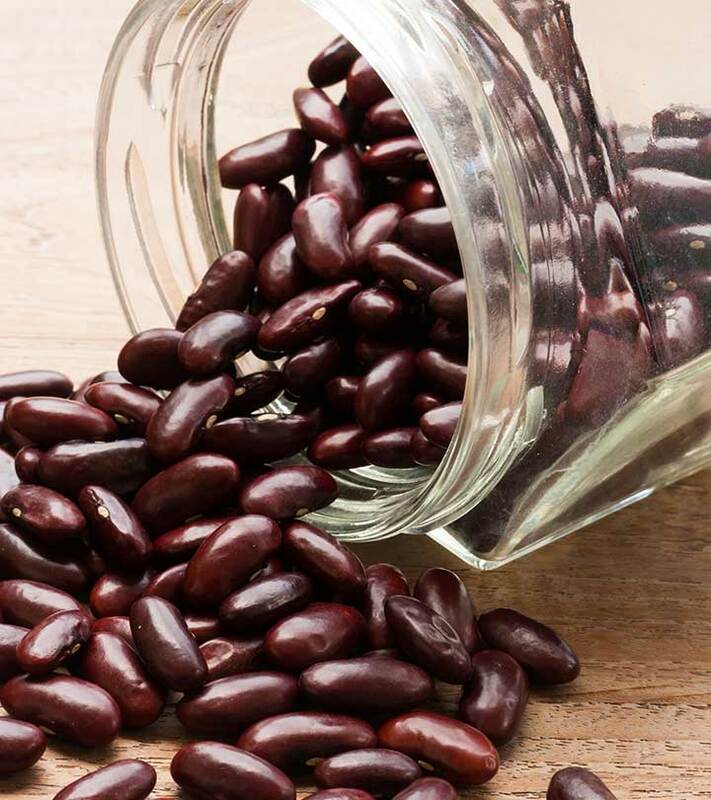 As discussed earlier, red kidney beans contain phytohaemagglutinin, a lectin that may cause digestive issues. This is true if you consume the beans in the raw or undercooked form. 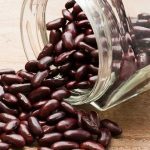 Raw kidney beans contain 20,000 to 70,000 hau1 of phytohaemagglutinin, while wholly cooked beans contain just 200 to 400 hau (5). In rat studies, phytohaemagglutinin had caused mucosal disarrangement and functional impediment of the gut (6). Though other beans (white kidney beans and Greek butter beans) contain lectins, the red variety has them in the highest concentrations. Cooking them on high heat can deactivate this lectin. However, you need not give up on legumes like red kidney beans. They have a low glycemic index and work well in preventing type 2 diabetes and cardiovascular disease (7). Soybean lectins are also called soybean agglutinins. Like red kidney beans, soybeans are also comparatively high in lectins. Studies show that dietary soybean agglutinin may affect the secretion of certain hormones that modulate blood glucose reserves (8). These studies conducted on rats also showed a poor growth of the spleen and kidneys. Although the effects in humans may not be as drastic, caution is recommended. 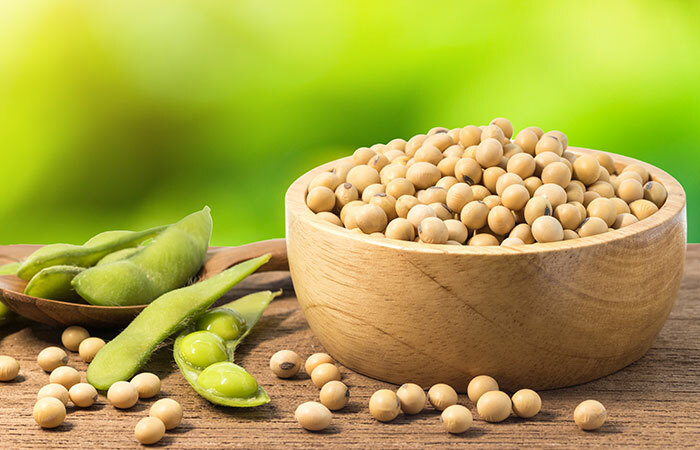 Other studies also show that soybean agglutinin can negatively impact intestinal structure, intestinal permeability, intestinal flora, and the mucosal immune system (9). On the positive side, soybeans help lower cholesterol and cut the risk of obesity and type 2 diabetes (10), (11), (12). Sprouting soybeans was found to reduce the lectin content by 59% (13). This can work with peas too, which contain phytic acid, a lectin (though not in very high amounts). Wheat contains a lectin called wheat germ agglutinin (14). This lectin can alter the intestinal epithelial and bacterial cell function in the human bowels (15). In rat studies, ingestion of wheat germ agglutinin reduced the digestibility and the proper utilization of dietary proteins (16). In another study, wheat germ agglutinin was found to trigger the synthesis of pro-inflammatory cytokines (compounds that promote inflammation in the body) (17). Lectin activity has also been observed in other cereal grains like oats, corn, rice, and barley – although the most studied is the one found in wheat germ (14). But whole wheat has some beneficial effects too. Its high fiber content can benefit the gut (18). Whole wheat also contains ferulic acid, an antioxidant known to fight heart disease (19). Tomato lectins were found to resist digestion in the alimentary canal of mammals, but they showed no harmful effects (20). Apart from this, there is not enough research showing us how tomato lectins may be bad. Some people do react to tomatoes – but that might have more to do with a condition called pollen food allergy syndrome than the lectin content (21). The most important aspect about tomatoes is their lycopene content. Lycopene has been found to drastically reduce the risk of chronic illnesses like cancer and cardiovascular disease (22). The lectin in peanuts is called peanut agglutinin. Studies show that this lectin may encourage human cancer growth. Unlike lectins from red kidney beans or soybeans, peanut agglutinin is quite resistant to heat and may not be eliminated through thorough cooking (23). This lectin also rapidly enters the human bloodstream right after the ingestion of peanuts and can accelerate the spread of human cancerous tumors (23). But these studies were carried out using very high doses of peanut lectins placed directly on cancer cells. We don’t have research suggesting what exactly happens within the human body. On the other hand, peanuts are replete with bioactive compounds that prevent disease and promote longevity. Compounds like resveratrol and flavonoids can block cholesterol absorption from the diet (24). Regular intake of nuts, including peanuts, can also cut the risk of heart disease (25). Potatoes contain a lectin called solanum tuberosum agglutinin that is resistant to heat. About 50% of the potatoes’ lectin content remains intact even after cooking (26). 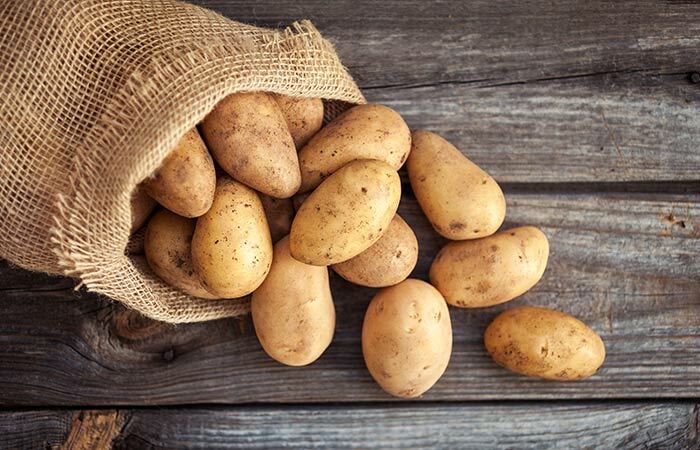 One study suggests that these lectins may cause adverse effects in some people who eat potatoes (26). But potatoes work wonders for your health. The skins of the veggies are rich in fiber. The vegetables are also great sources of vitamin C, B vitamins, and potassium (27). We have less information here. But some anecdotal sources suggest that vegetable oils made from high-lectin beans or seeds (corn oil or soybean oil) can contain lectins. These oils could also be genetically modified, adding to the potential ill they can cause. We have inadequate information here too. Dairy products made from North American cows may contain casein A1, a lectin-like protein. This may cause certain adverse reactions. Coconut milk can be a wonderful alternative in this case. These are the most common foods that contain lectins. Does this list contain any of your favorite foods? Does this mean you can’t eat them anymore? Well, the news is not as bad as you probably thought. It is important to understand that most studies on lectins have been performed on animals and not on humans. Also, these studies involved the use of lectins in excessively high amounts. It is rare for anyone to consume so much of the above foods to be affected by lectins. But then, we need to exercise caution. If you are someone with food sensitivities, abdominal issues, and other digestive complications, you may want to limit the intake of the foods high in lectins. More importantly, ensure you cook them properly. Avoid consuming raw or undercooked foods. We don’t recommend you to eliminate these foods from your diet – as they contain some of the most powerful nutrients that are beneficial for your health. Also, doctor consultation is recommended. If you are a healthy individual, you shouldn’t have a problem. Cooking the foods properly should do the trick. In addition, there are certain other tips you may want to try. The methods are simple. Just some extra effort from your end can go a long way in keeping you healthy. Peel and deseed fruits and vegetables. The skin (or hull) and seeds tend to contain the highest amount of lectins. Use a pressure cooker. This uses more heat, eliminating lectins in the process. Avoid slow cookers as they wouldn’t be as effective for this purpose. In a study on peas, cooking them in a pressure cooker reduced the lectin content by 59%, as opposed to a mere 29% through regular boiling (28). Ferment. This is especially true in the case of soy. Fermenting also boosts the health benefits of foods. Sprout. Sprouting of seeds, beans, and grains helps lower their lectin content. There are exceptions, though (like alfalfa). Eliminating all high-lectin foods from your diet is neither possible nor ideal. You can reduce your intake of certain foods and follow the methods discussed here to reduce their lectin content further. Also, don’t forget to keep your doctor in the loop. What else do you know about lectins? Do tell us by leaving a comment in the box below. “Lectins are specific carbohydrate-binding proteins” National Center for Biotechnology Information. “Lectins” Harvard School of Public Health. “Naturally occurring food toxins” Toxins, US National Library of Medicine. “Do dietary lectins cause disease?” The British Medical Journal, US National Library of Medicine. “Handbook of foodborne pathogenic…” Bad Bug Book, FDA. “Binding and the effect of the red kidney bean…” British Journal of Nutrition, Cambridge University Press. “Effect of legumes as part of a low glycemic…” Archives of Internal Medicine, US National Library of Medicine. “Effects of soybean agglutinin on body…” Archives of Animal Nutrition, US National Library of Medicine. “The influences of soybean agglutinin…” International Journal of Molecular Sciences, US National Library of Medicine. “Meta-analysis of the effects of soy…” The New England Journal of Medicine, US National Library of Medicine. “Role of dietary soy protein in obesity” International Journal of Medical Sciences, US National Library of Medicine. “Legume and soy food intake and the...” American Journal of Clinical Nutrition, US National Library of Medicine. “Optimisation of germination time and temperature…” Food Chemistry, United States Department of Agriculture. “The dietary intake of wheat and other…” Nutrients, US National Library of Medicine. “Identification of the dietary lectin…” Gastroenterology, US National Library of Medicine. “Antinutritive effects of wheat-germ agglutinin…” British Journal of Nutrition, Cambridge University Press. “Effects of wheat germ agglutinin on human…” Toxicology and Applied Pharmacology, US National Library of Medicine. “Whole-grain wheat breakfast cereal has…” The British Journal of Nutrition, US National Library of Medicine. “Ferulic acid: therapeutic potential through...” Journal of Clinical Biochemistry and Nutrition, US National Library of Medicine. “Tomato lectin resists digestion in the…” FEBS letters, US National Library of Medicine. “Adverse food reactions in patients with…” Annals of Allergy, US National Library of Medicine. “Tomato lycopene and its role in human health…” Canadian Medical Association Journal, US National Library of Medicine. “Peanut agglutinin appearance in the blood…” Carcinogenesis, US National Library of Medicine. “Peanuts as functional food…” Journal of Food Science and Technology, US National Library of Medicine. “Nut consumption and risk of coronary...” Current Atherosclerosis Reports, US National Library of Medicine. “Purification and characterization…” The Journal of Biological Chemistry, US National Library of Medicine. “Potatoes and human health” Critical Reviews in Food Science and Nutrition, US National Library of Medicine. “Effect of domestic processing and cooking…” Plant Foods for Human Nutrition.